The rubber may meet the road once the automobile rolls off the assembly line, but where the rubber meets the steel is the secret that can make that assembly line more efficient. Mallard’s custom designed steel skate wheel flow system for tires…Tire Flow… is another unique gravity flow application from the gravity flow specialists. Our rugged steel skate wheel flow rails are custom mounted on an angle to cradle tire bundles and flow them from storage to assembly or order picking in a smooth, fast, easy manner. Tire flow supports a first-in/first-out (FIFO) inventory rotation with the capability of storing a unique SKU in each lane for 100% selectivity and simplified, accurate picking. Tire flow is an ideal solution to reduce warehouse traffic and increase assembly and picking efficiencies. 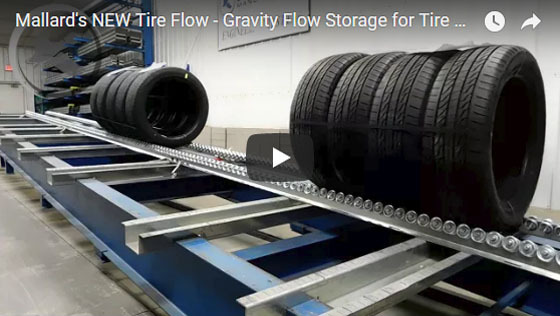 Tire flow can be integrated with automated systems, a popular application in larger production operations – Standard forklifts equipped with carpet poles can load or unload the tire bundles. 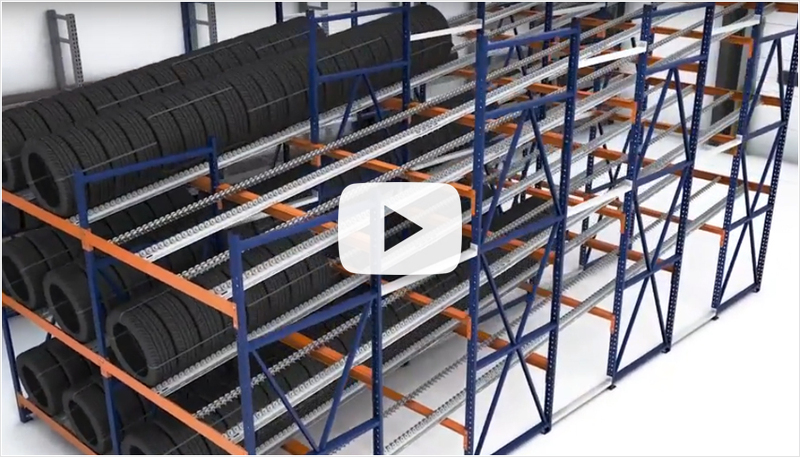 Pick aisle positioned cranes can also be used to retrieve the tire bundles and deliver them to assembly stations. Check out our tire flow test below. Tires bundled into groups provide stability for the flow lane and hasten the loading and unloading vs single tires. Rails are recessed slightly so that the front beam acts as a ramp stop which secures the tires in the lane until removed. Tires are loaded using a standard forklift with a carpet pole attachment and unloaded using a crane which will deliver the bundles to their assembly stations. Both methods should work seamlessly for this tire flow application.